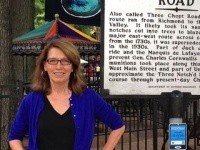 Mary Joy Scala is the Preservation and Design Planner for the City of Charlottesville. Mary Joy Scala graduated from Mary Washington with a degree in Studio Art. She first moved to the Charlottesville area to attend the UVA School of Architecture and graduated with a Masters in Planning. Before becoming Preservation and Design Planner for Charlottesville, she was Executive Director at Valley Conservation Council, a non-profit organization in Staunton, VA.
↑ Web. Meet your government: Mary Joy Scala, Charlottesville Tomorrow, June 16, 2012, retrieved June 22, 2012. This page was last edited on 23 June 2012, at 11:08.